Magnus and Richard booked in with myself wanting to feel smoother when riding descents and feel more confident as they do such events as trans-provence etc and saw themselves as cross country riders. I could see the missing skills in their riding skill sets as I ran them through my skills check and adjusted Magnus’s set up too. We as ever, began with applying both physical and mental skills sets to the drop technique as soon they were riding them all in total control. I moved onto cornering and controlling their edges in turns, something that they were familiar with from other sports and they were absolutely amazed at the result of applying the technique that i teach as grip and control went through the roof as that made them faster. We applied the same cornering technique to three berms and they were linking them together nicely by the time we broke for lunch. We resumed by moving to the singletrack to work on using the techniques we at ukbikeskills teach and applying them as required in the fourteen sections contained on the trail. 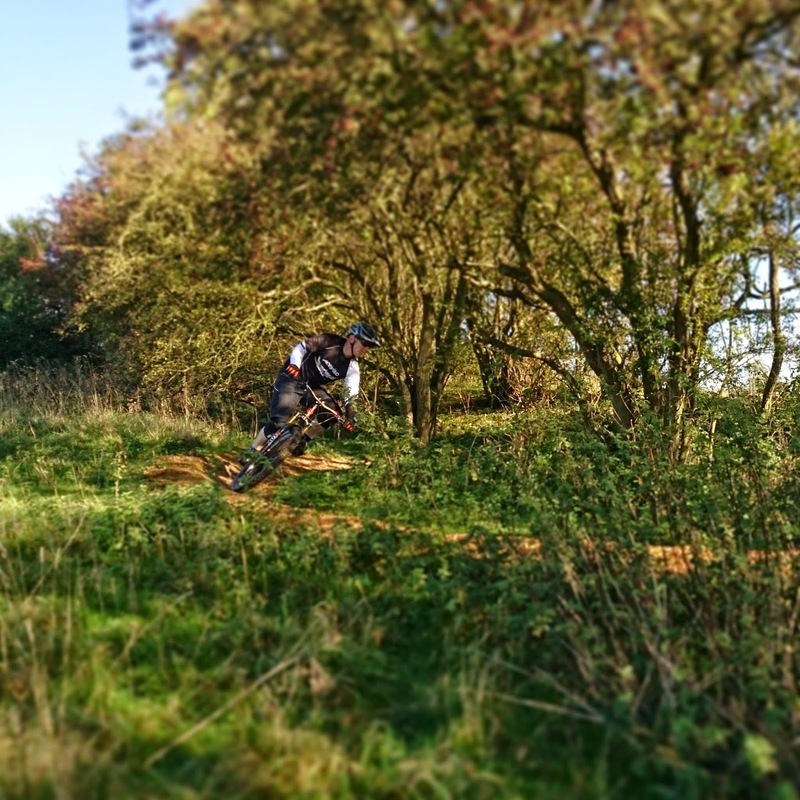 Flat, bermed, off camber and switchback turns were linked to jumps, drops, rock gardens, pumping and steps. by the time I’d demonstrated each section and they were riding the trail top to bottom they were already self diagnosing any errors in any section and also they were growing more and more controlled and confidence soared. The drop into the berm at the end of the trail was something they both thought beyond them but it now flew beneath them as they sailed into the air with ease. We moved to steeper terrain and eventually, a near vertical drop off and once again , by applying their new skills sets they both rode it easily. I knew they were tiring but I wanted to work on something they asked about when we met, how to ride over logs and fallen trees along the trail. They rode all three logs I placed out, after I demonstrated the techniques involved and the look on their faces was a picture. They both then called an end to the session, tired and happy. Chris and Stan made the journey up from Cardiff after hearing about www.ukbikeskills.co.uk coaching on the uplift at bike park Wales 6 months ago and wasted no time in researching and then booking in with us. They choose to go ahead with myself for their coaching and today was the day. The skills check showed me errors in their skills sets and footwork and body positioning was paramount in this correction, so a set up change was made and the effect could be felt immediately. Drops were the first sections we applied their skills sets to and the required technique was demonstrated by myself first obviously. All three drops were ridden easier and with more control than ever before and they were blown away. Cornering was next and here they applied their new skills sets to the technique myself and Nathan teach. one, two then a third berm flew past with control and they developed speed through each turn. We took a welcome coffee break before resuming with linking drops into corners and the required braking technique and line choices. When we first met they said they wanted to learn to jump rather than hang on and hope at their local bike park wales. I began with applying the skills to a 6ft tabletop, followed by a 6ft gap which they soon were sailing over effortlessly. We moved to a more complex 7ft gap jump that requires speed to be carried through two corners to ride and they blew themselves away by riding that easily too. They were tiring quickly now but we still had time to not only ride the 9ft gap jump a few times but to also link the berms, gaps and pumping from earlier. Cracking session in beautiful sunshine. Tony googled skills coaching and found ukbikeskills on the first page and as he used to live in Hertfordshire, he contacted us for a session. The day arrived and sunshine greeted us as I ran him through the skills check that both myself and Nathan use to identify areas needing work.. I found perfect footwork and great looking skills but discovered a body positioning error that had its foundation in Tony’s past of motor biking. I set to work and a set up change assisted this. We began with the drops and applying his new skills sets to the technique involved and immediately, Tony was landing perfectly. The largest drop of 3ft proving no issue now. Next we worked on applying his new skills to cornering and this soon found him railing through three linked berms and I found a weakness in his right sided turns that I worked on also. A coffee break was taken, and we resumed by moving to the skills singletrack to work on his fluidity and control of a trails speed.Flat, bermed, off camber and switchback turns were linked to rock gardens, pumping, steps, drops and drop offs. I worked on control areas as well as line choice and soon he was flying. Any errors were now being self diagnosed as he could feel why it was right in any section. Onto jumping and I used a 6ft tabletop for this. Tony had never jumped before and was amazed at how simple and effortless it felt when his skills sets were applied and soon he was clearing it with ease. I could see he was tiring but our session didn’t end there, we moved to the pump and jump trail to work on controlling and gaining speed through a trail, linking and carrying speed through three corners and jumping the final jump. A few runs later mentally, Tony was done and physically too, so an awesome session came to a close. John was bought a voucher at xmas for his session and he got around to booking it during the summer. The day arrived and we met as arranged at 10am and I began installing the skill set that myself and Nathan at ukbikeskills.co.uk teach. I found John needed work on his looking and body positioning and I began by adjusting his set up and from there everything began to make sense to him. We moved to the three drops to work on getting air under his wheels and any trepidation was soon replaced by control and a renewed confidence as John rode all three drops , applying his mental skills as he did so. Next we worked on cornering and carrying speed through one, then two, followed by three berms as his new skills shone through. Onto the singletrack to apply his new skills and with some braking and line choice suggestions, John was soon flying down the trail applying his skills to each sections and smiling as he did so too. Rock gardens, steps, pumping, drops and absorbing techniques were all applied and linked with flat, off camber , switchback and bermed turns. Every run, although not perfect had any errors being self diagnosed by John as he now knew why it felt right or wrong in any section. I could see he was tiring but I wanted to develop his pumping and absorbing of trail features some more and a half hour of that saw big improvements as he understood why and where to apply the techniques. Tiredness eventually got the better of John so our session ended with a final coffee in the warm October air. I coached David over two years ago and he wanted to return as he’d stopped attempting any gap jumps and felt that he’d lost his mojo a bit. The skills check showed he’d retained his cornering skills and that I needed to just work on his body positioning for jumps and drops as that was where the problems he was experiencing laid. I began with the drop technique and immediately it was glaringly obvious why he felt out of control and i set about correcting this. I moved to a 6ft tabletop and worked on his take off and delayed his landing as i had to separate both techniques until he began to land smoothly. I worked on speed and effort for distance too and even style in the air as the renewed skill set blossomed. Dave rode the 6ft gap jump too over and again as his mental skills grew and grew. We moved to cornering and carrying speed through three berms and linked the jump at the end before moving to linking two berms and the 7ft gap jump after. This really set the adrenaline pumping and it wasn’t long before we were at a 9ft gap jump that at the start of the session, David had thought beyond him, but soon he was riding it smoothly and comfortably, even linking the trail above it with a big cheesy grin on his face. I’m writing this with a beer that David had gifted to me when he arrived and I raise it in toast to an awesome session and a diamond geezer. Barry and Kev arrived as arranged and I found what errors they had in their skills sets and I made some set up changes to enhance their positions. We then worked on riding berms and carrying speed through them before moving to riding singletrack and the accompanying techniques involved. We worked on braking technique and control areas as well as line choice. Flat, bermed, off camber and switchback turns were linked to pumping, absorbing, steps, rocks gardens and drop offs. Both Barry and Kev were riding with more control than ever before and faster too. Pete and Cooper came to me after recommendation and wanted to learn to jump . Simples I thought and the skills check showed me they were accomplished riders but errors in their skills sets had developed into fear of air. Looking and body positioning were predominantly in need of work as well as Peter’s footwork in corners and also his lead foot too. A simple set up change was done and off we went to apply both mental and physical skills sets to the techniques required. The drops were first and soon they were riding the largest drop easily and comfortably and we moved across to the 6ft tabletop and gap jump straight after, which they looked surprised at. In a few small adjustments , they both began sailing over the tabletop with ease and to their amazement, they both started comfortably riding the 6ft gap jump too. All this within 2 hours of us meeting. We began working on cornering and before long they were linking three berms together and riding the jump that followed too. Then they rode two berms and rode the 7ft gap jump that followed and this blew them away as it now felt like they’d always known how to jump. We took a break and then resumed by riding the singletrack skills trail and i worked on their fluidity and line choice until they were riding the trail and its fourteen sections smoothly and controlled and that made them faster and faster. We moved to the pump and jump trail that is above the 7ft gap jump and they were pumping and jumping for fun now and much to their surprise, they rode the 9ft gap jump at the end of the line too. The session ended after a good few complete runs of the trail and they linked the 7ft and 9ft gap jumps into the line with absolute control and ease. Amazing end to a great week of coaching.